So this was kind of fun. 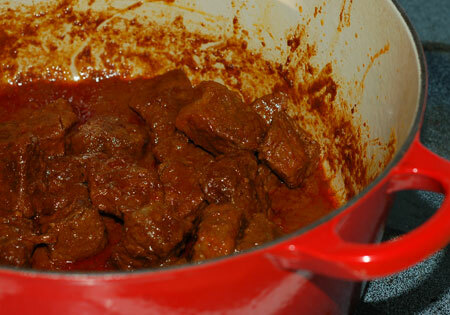 I’ve had a sort of off-hand interest in making the beef rendang from Molly Stevens’ All About Braising for a while now, since reading rave reviews of it on eGullet. However, Molly’s version includes a few ingredients that I am pretty sure I couldn’t get in Salem, and have never actually seen in real life, such as fresh galangal and turmeric. (I’m not even sure I had realized dried turmeric came from a root, for that matter.) The ingredients essentially add up to a red curry paste, in which beef is slowly cooked with coconut milk until all the liquid evaporates, and the beef is fried in the remaining coconut oil and gravy-like remnants of curry. After our last order of Curry Simple sauces arrived, I looked over the booty and began to wonder if I might be able to use some of it to make a simplified version of beef rendang. Jeremy brought me home a beautiful 3-pound brisket, and the next day I cut it into cubes, trimming off the fat cap as I went, and tossed it in my big Dutch oven with some whole star anise, a chunk of ginger, and enough red curry sauce to cover. It simmered ever so slowly away into the evening, and after a few hours of periodic stirring, I had a potful of tender beef covered in a rich mahogany gravy. 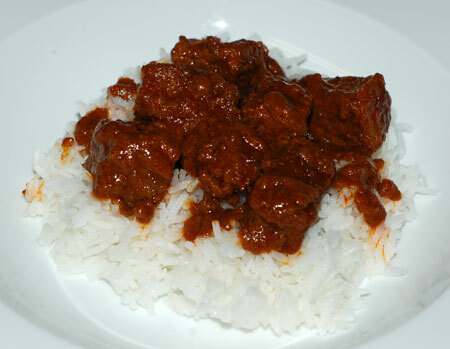 Served over rice, it took no more of my time to prepare than does our favorite masaman curry, just spread out over the course of an afternoon, and the flavor was fantastic. Mind you, we haven’t eaten the red curry yet in its more basic form, but cooking it down with the beef made it complex and savory, with hints of sweetness, citrus (from the lemongrass and kaffir lime leaves, I imagine), and heat. It was a bit spicier than the masaman and yellow curries, but nothing a tall glass of water, a pile of rice, and a scoop of white chocolate ice cream for dessert couldn’t solve. If I ever track down a source for fresh galangal and turmeric—there must be some in Portland somewhere, right?—it would be fun to try my hand at mixing my very own curry paste. In the meantime, we’ll definitely be making this version again! In a large Dutch oven over medium high heat, cook the brisket in the olive oil just until the meat begins to get a good sear. 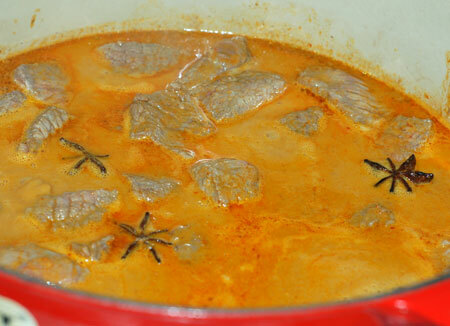 Add the star anise, ginger, and just enough red curry sauce to cover the meat. You may not need the whole packet; the excess can be refrigerated or frozen. Stir to combine and bring to a simmer, then reduce the heat to low. Simmer very slowly uncovered for 2-3 hours, stirring every 25 minutes or so, until the curry sauce reduces to a thick gravy. If desired, skim off any excess fat before serving over rice. I don’t know about fresh galangal, but we’ve had very good luck finding dried indian spices. Lifesource has a bunch of dried spices in bulk, including garam masala, and we get many of our indian spices there. I believe Crystal has found some at the Herb Lady that we can’t get at lifesource. And we’ve found some additional stuff at the A Dong market, which has a variety of packaged spices. There was also an Indian grocery store on Lancaster that had some thing, including panir, but I’m not sure that they’re still in business. Lifesource has panir though. On your recommedation I am bidding on All About Braising on eBay, sure hope I win. Laura, hope you like the book as much as we have! I certainly seem to be working my way through the entire thing.